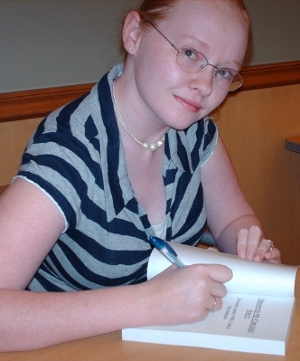 Rebeka Huggins became an author after she found out she had MS. She found a need and filled it. Rebeka Huggins book is a valuable resource for MSers - by sharing the stories and poems of many of them with us. If you like reading how others are experiencing and dealing with MS in their day to day lives, buy her book. Stories and poems from people like you. I'm sure you will enjoy her story as much as I did. Question 1: Hi Rebeka, thanks for sharing your time with us today. Please introduce yourself to our readers who may not be familiar with you, and use this opportunity to tell us where we can find you on the web as well as any projects you are working on. Thank you very much for giving me this opportunity. My name is Rebeka Huggins. I'm 25 and was diagnosed with Multiple Sclerosis 5 years ago. Although it was devastating to be diagnosed with a chronic disease, I decided to try and make the best of it. So I began working on my first book - "I Dropped My Chicken Soup: Stories about Multiple Sclerosis". It is a collection of stories and poems from 70 people in 5 countries who all deal with multiple sclerosis, either by themselves being diagnosed or having a loved one diagnosed with it. I'm just getting ready to do a second edition, and I'm also currently working on a similar book about Parkinson's disease. I am on Facebook and Myspace under the name MS Stories, and I have a website MS Stories. Question 2: Your book – I Dropped My Chicken Soup is a compilation of many authors. What gave you the idea to put their stories and poems into a book? I always looked to books for help when facing something I didn't know. This was no different when I was diagnosed with Multiple Sclerosis. However I found after my diagnosis, I was having trouble reading books. I'd forget what happened in the previous chapter, and sometimes even on the previous page. I also didn't feel that the books always related to my case. Everyone has such different symptoms and ways of dealing. So I began to look for a book that had a lot of people's stories. When I didn't find one I decided to make my own. Question 3: You have decided to write another book. What will it be about and is it in a similar format (many authors) as your other book? Are they the same authors or different? The second edition will have updates from some of the authors who were in the first book. However, I'm looking for new authors as well. The book about Parkinson's disease will be a similar format, many stories by many different people. Question 4: Rebeka you just got married recently. How did you meet your husband and has he always known about your MS? I met my husband through a mutual friend almost seven years ago. He was with me through my diagnosis. Yes, he was always more than willing to learn about my MS, and to attempt to help me through many of the issues. I am definitely blessed that he has stood by me and loved me in spite of everything that has happened. Question 5: What type of MS do you have? Do the symptoms you have effect your work? How do you deal with them? I have relapsing-remitting MS. Yes, my symptoms have definitely impacted my work. I no longer work outside of my house. Writing and promoting my book is my full-time job now. I have a lot of fatigue, so I take naps daily. I also have issues with my eye site. I often ask my husband to read my e-mails to me to deal with this.